As we wrap up the last of another successful Warpstock event, we want to extend our thoughts and prayers to all those affected by Hurricane Florence in the US. We are aware of at least one regular Warpstock attendee who is located within a designated evacuation area. Please stay safe and healthy - all of you. To those participating in the relief efforts, we salute your noble work. Our thoughts and prayers go out to you, as well, for a safe and successful mission. Thank you for your service to those in need. The hotel has the following information about their free airport shuttle. We are pleased to offer complimentary shuttle service to and from Calgary International Airport (YYC) for arrivals and departures from 4:00 a.m. to midnight. daily. For domestic arrivals, shuttle pick-up is located outside on the arrival level at Bus Bays #16 and #17. For international arrivals, shuttle pick-up is located outside on the arrival level at Bus Bay #37. Once you have collected your luggage, you can request pick-up by calling the hotel from one of the courtesy phones located at the information booths in the terminal. For return service to Calgary International Airport from the hotel, please see the front desk for booking information." Hotel room block cutoff for Warpstock 2018 EXTENDED TO AUGUST 20! Working with the hotel, Warpstock has been able to negotiate an extension of the room block cutoff until August 20. This adds a few more days to our guaranteed conference room rates of King or Two Double: $119 CAD/night; Suite: $134 CAD/night (remember, these rates are stated in Canadian Dollars; today's exchange rates have these figures at close to $90 USD and $100 USD, per night, respectively). After the cutoff date, rooms will be available at the normal daily rate, as available. Why wait? 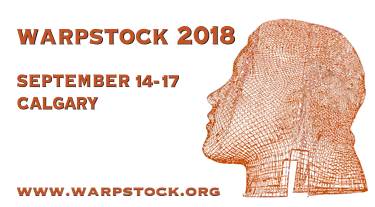 Register for Warpstock 2018 today, and use this direct booking link or by telephone: 800-830-5222 or 403-250-1800 to book your room. When calling or using the hotel's main website, use the booking code "0913WARPST" to get the conference rate (the direct link should apply this automatically). Check out some of the great sessions planned for Warpstock 2018! Each year, we try to bring to the event presentations which will inform, enlighten, and engage with the interests of users and developers. 2018 is no exception to this tradition. This year, we have sessions on a wide range of topics, from effectively using Github to preserve code to latest happenings at Arca Noae and bww bitwise works, to tips and tricks to make your work go more smoothly. This year's schedule allows plenty of time for small, informal, breakout sessions, too, so be sure to bring your questions - and your knowledge - to Calgary, September 14-16. Joe Suttle will be our keynote speaker this year. Joe gave an outstanding talk in Orlando in 2016, and is engaging, entertaining, and most of all, knowledgeable of his subject matter. Register for Warpstock today and be sure to catch Joe's keynote in Calgary. If you haven't yet booked your hotel room for Warpstock 2018, now is the time. The hotel room block cutoff date is August 13, after which any unreserved rooms from our current reserved block will be released for general sale by the Country Inn & Suites By Radisson Calgary Airport. Reservations made after the cutoff will be on an as-available basis. Why wait? Register for Warpstock 2018 today, and use this direct booking link or by telephone: 800-830-5222 or 403-250-1800 to book your room. When calling or using the hotel's main website, use the booking code "0913WARPST" to get the conference rate (the direct link should apply this automatically). (King or Two Double: $119 CAD/night; Suite: $134 CAD/night). Here are some interesting facts about the Warpstock 2018 event logo (read more, below). Warpstock 2018 gear is here! The Warpstock 2018 gear has arrived in our Cafepress store. We've got shirts in a variety of styles and a broad range of sizes, BBQ aprons, mousepads (yes, even optical mice need mousepads! ), pins, coasters, glasses, cups, coffee mugs, sports bottles, bumper stickers, underwear (don't ask! ), even baby and doggie attire, and a whole lot more. Please visit the shop to see the whole collection! While the bulk of the purchase price goes to the supplier, 10% of the price goes to Warpstock to help us with future events and ongoing expenses. Warpstock, the annual conference for ArcaOS, OS/2, and eComStation users, administrators, and developers, is now open for registration! Warpstock 2018 will be held at the Country Inn & Suites By Radisson Calgary Airport, located at 2481 39th Avenue NE, Calgary, Alberta, Canada T2E 8V8. This year's event will begin Friday, September 14 and continue through Sunday, September 16. We are working hard to make this another event chock-full of enjoyable and informative sessions, featuring an all-star cast! Join us, as a presenter or as an attendee. ArcaOS continues to wow new, continuing, and returning OS/2 users, and there is a lot to explore and learn about this powerful, secure, alternative operating system - today's answer to intrusive, spying, commercial and open source systems, which is still amazingly versatile and remarkable agile on today's hardware! Find out more about this year's Warpstock! Register before May 1 and receive a $30 Early Bird discount on a full or daily conference registration! Spouses/family members/guests/office mates attending sessions also receive great discounts, and non-attending guests are FREE. Students with valid student ID are welcome to attend sessions at no charge, with full benefits! Remember to book your hotel and travel early (we have negotiated great rates for this year's event - King or Two Double: $119 CAD/night; Suite: $134 CAD/night). Come early and stay a few days to see the sights and keep the conversation going!